Beat the Bookstore franchise for sale. Free Beat the Bookstore franchise information. Our concept is very simple. It is centered on catering to students, not publishers, wholesale companies, authors, nor administrators. We buy for more and sell for less; provide uncommon customer service, treat students with respect, and have fun in the process. Our stores don't even look like a college bookstore. They have no high priced junk, no fudge, no candy, no sweatshirts, no glassware, no decorative spoons, no trinkets, no bumper stickers … and no apathetic managers or employees. They just have cheap textbooks and genuine respect for students. The opening of our first store created an absolute frenzy. Students came by the hundreds. They sold their used books and bought new ones. As they left they took stacks of business cards - left them all over campus and gave them to their friends. On the first day of class professors told students they could buy books cheaper at Beat The Bookstore. Parking shuttle drivers announced it over the PA system. Employees at the campus information desk gave students directions to Beat The Bookstore and passed out business cards. The store was inundated with students. Even employees of the campus bookstore came in to buy and sell their textbooks. There were more customers than the store could handle. It was pure pandemonium! College students have little money to spend, but they have many expenses. Tuition is unbearably high, and yet increasing. Living expenses can be equally daunting. But students perceive textbooks to be the most infamous extortion of their money. It is not surprising that the majority of students distrust, dislike and are frustrated by the campus bookstore. They perceive that the bookstore offers high prices low buy back values and unacceptably poor service. 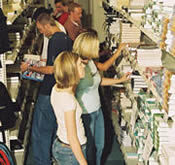 According to the National Association of College Stores study, U.S. students payed an average of $807 for books and supplies during 2002-2003, compared to $619 in 1999-2000. That's a 30% jump in only three years! Traditional college bookstores are charging exorbitant fees for textbooks and setting very small buy-back quotas and very short buy-back periods for used books. Often they meet their quotas on the first day of buy-back. If students don't make it to the bookstore on that first day they're often out of luck. They may be offered an insulting pittance of the book or nothing at all. You should join Beat the Bookstore! Franchise opportunities are now available in 30 states and increasing quickly. Obviously, there can only be one Beat The Bookstore at any college or university. So, if you are interested in liberating the campus near you, then contact us today! To learn more about the Beat the Bookstore franchise opportunity, simply complete the form below.